Over 40 rides and attractions make Indiana Beach fun for all ages. Indiana Beach is where theme park classics like the Paratrooper, Carousel, and Tilt-a-Whirl meet with the thrills of one-of-a-kind rides like Lost Coaster and Tig'rr. From the kiddie rides to the water park, there's a lot to do for every member of the family. New for 2019! Wait 'til you step into our rethemed kiddie area! We let our imagination run wild and Rocky’s Toy Box is full of big surprises. Biggest of all is Tommy, the new Talking Train. All aboard… story time’s about to start! Pardon our dust! 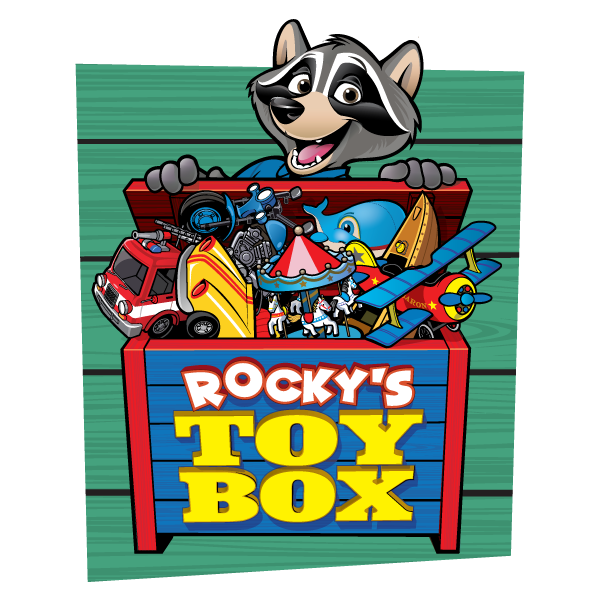 Kiddie Ride availability will be limited as Rocky’s Toy Box comes to life. With crazy turns, frightening drops and insane twists & surprises, this Wooden Coaster was rated #1 in the World by ThemeParkCritic.com in 2002. From its nearly vertical first drop, the extreme g-forces of its helix, to the spectacular double-drop finale. Riders must be 46" or taller to ride. The Double Shot is a ride that takes family fun to a whole new level ... and then right back down again! And then up one more time! A thrilling rush with an amazing view of Lake Shafer, the Double Shot stands over eighty-feet in the air and is one of the most intense rides at Indiana Beach. Riders are taken for a wild trip of turns and drops on this wooden coaster with steel super-structure, a pioneering design created with Indiana Beach. The untamed ride runs nearly the full-length of the Boardwalk Funway and back again, skimming the very edge of the waters of Lake Shafer. Riders must be 48" or taller to ride. The most bone-rattling, twisting, turning, surprise is a wicked trip through the mine tunnels of Superstition Mountain. Wild animals, a rolling mill, falling rocks, and many other surprises await within the mountain. Sail the rocky seas aboard this replica ship, but don't be fooled by the gentle start as riders experience moments of weightlessness & pure laughter. 48" to ride alone. 36" to ride with an adult. Experience the thrill of sky-diving and hang-gliding after you pull your ripcord at 110 feet in the air. Not included with a Funday Wristband. A pay as you play attraction. Steel Hawg is Indiana's first custom steel coaster and stands nearly 10 stories tall, featuring multiple heartline spins and inversions as well as a 111-degree first drop-and was once the steepest in the United States! An intense steel coaster that digs its claws into riders and sends them for a trip of sudden drops and banked turns. A single “super loop” that towers six stories high. Daring riders scream with delight as they go round and round on the inside of the giant loop and speed over the top upside down while experiencing “hang time” to catch a glimpse of the people far below. The new coaster shuttles back and forth on the inside of the super loop, gaining height and speed with each pass. Then the lucky riders hurtle over the top to enjoy the adrenaline rush of six head-over-heel inversions, forwards and backwards, inside the giant ringed track. Take flight over the waters of Lake Shafer as guests pilot their own plane, coasting on the very wind itself, swinging themselves to new heights of thrills and happiness. 44" to ride alone. 36" to ride with an adult. Enjoy a leisurely car ride with the whole family on the only Antique Auto ride in the world built mostly over water. 44" to ride alone. To ride with an adult, child must be able to sit up alone. Taking family fun to its wettest level, The Big Flush is Indiana Beach's refreshing and unique water coaster. Take your choice of either of two wild experiences: the wicked twists of the blue tunnel or the surprises within the darkened black tunnel. 44" to ride alone. 42" to ride with an adult. Aye Aye Captain. Enjoy the fun and excitement of piloting your own boat while you cruise the lagoon searching for other landlubbers to collide into. It’s crash and splash fun right on the famous Boardwalk. This unique dark ride experience takes riders into the secret lair of a wealthy group of pirates and thieves. It is the rider's duty to take aim and bring these criminals to justice, and score some gold along the way. It's all about driving your car and running it into family & friends. Bounce off the walls, bounce off other cars, and don't stop until you've had enough. Step into a realm ruled by ghosts, ghouls, goblins, and trickery. Guests have been trapped and lost forever in a room of doors. Some have run out screaming from the mere touch of a rat's tail against their skin. Still others have come out and said they have never had a better time. Thrill to the ups and downs and round and rounds of the Falling Star. And just when you think this ride is all done, it takes you back around the other way! A peaceful delight for families to enjoy a bird's eye view of the lake as well as the entirety of Indiana Beach. During the evening hours, it is illuminated by nearly 6,000 lights. You’ll be transported back to the “good old days” with this old-fashioned carousel ride. Choose from 60 colorful fantasy horses to ride or sit and relax in a Goddess of Cherubs chariot. 42" to ride alone.To ride with an adult, child must be able to sit up alone. Families will enjoy a new take on the traditional teacup ride with the Growler. 48" to ride alone. 38" to ride with an adult. Take a ride with music and enjoy an up-and-down, forwards-and-backwards classic ride the whole family will enjoy. Take to the skies and descend just as fast on the sails of the Paratrooper. Spin around and glide into the air, falling back to the water's edge all on the gentle turns of the Paratrooper. Take a cruise inside a small boat that gently spins, dips and peaks on ocean swells. With this ride the entire family can enjoy the experience at the same time. 42" to ride alone. To ride with an adult, child must be able to sit up alone. This log flume takes you through tunnels and some quiet waters, but don't be fooled. At the end awaits a plunge straight down into some chilled waters. Featuring chariots and horses for guests of all ages to delight in as they ride to the sounds of the carousel organ music. Must be able to sit up alone to ride. Experience fun lateral g-forces as your seat spins in and out of a wild circle producing hair-flying fun. Firework cruises will take place 5/26, 7/4, 7/5, 7/6, 9/1. The Shafer Queen will depart 30 minutes prior to firework display. Take an overhead tour of the Indiana Beach Boardwalk Funway or view the Indiana Beach evening lights after dinner at the Skyroom Restaurant. ALL ABOARD! Bring the whole family and take a ride through our kiddyland, Haunted graveyard, and down to Paradise Island. The Spackman Express is a classic train ride for the whole family. Riders hop aboard and their seats start to turn along their course of ever-changing hills on a rotating platform. 46" to ride alone. To ride with an adult, child must be able to sit up alone. This is more than just a basic playground swing set; it's a high-soaring ride over the Indiana Beach midway. Everywhere you turn along the Indiana Beach Boardwalk Funway is an opportunity to test your skills and win fun prizes! Go fishing for prizes at the Game Barn! Test your aim at Shooting Star! Or, try for a perfect "swoosh" at Barnyard Basketball! Guests can even play from the sidelines at the exciting Splash Battle or try their hand at an electronic twist on "21!" The Indiana Beach Boardwalk Funway is home to two high-powered video arcades! Be sure and enjoy the main arcade beneath the Skyroom Restaurant to take a spin on pinball or try out your dance moves on Dance Dance Revolution! For more fun, there's a second arcade located in the shadows of Dr. Frankenstein's Haunted Castle! START YOUR ENGINES! Kids get the chance to be in the drivers seat as they ride around our track! Must be able to sit alone. Sorry, no adults allowed. Let your child set sail in their own boat! Complete with bell and sparkling water, the kids can experience the feel of the open sea right here at IB! Jump on board and take a ride on the back of Winky the Whale! With soft sea like motion and room for a friend, this promises to be one of the kids favorites! Must be able to sit alone. First Flight allows little ones to soar over Rocky's Toy Box, controlling their own bi-plane that rises and falls at the driver’s command. Bring your treasure and board our mini pirate ship just the right size for the smallest of scallywags! Children can set sail with a mild rocking motion that mimics its big brother the Sea Dragon. 36" to ride alone. To ride with an adult the child must be able to sit up alone. Adults allowed in middle seats. Ascending to the top and then "hopping" its way down, riders are jiggled and bounced until the laughter and smiles never seem to cease. Must be able to sit alone. To ride with an adult, child must be able to sit up alone. Kids come to the rescue aboard a fire truck or motorcycle on our Mini Motors. Sparking and full of fun, let your little hero's imagination run wild! Must be able to sit alone. Sorry, no over 54" allowed. ALL ABOARD! Bring the whole family and take a ride through our Rocky's Toy Box, Haunted graveyard, and down to Paradise Island. Spackman Express is a classic train ride for the whole family. Kids get to spin and swing around and around on our Wild Wagons; the pint size version of Tilt a Whirl. Float down the river and relax on a comforting inner tube and let your feet and hands drift in the cool waters surrounding you. The relaxing Action River is over a quarter-mile long, so grab a tube and relax in the summer sun as you coast along the edge of the Lake Shafer and our Sand Beach Swimming Area. Anyone under 48" is recommended to wear lifejacket all children under 15 must be accompanied by an adult (state law). Taking family fun to a splashtastic level, The Big Flush is Indiana Beach's refreshing and unique water coaster. Take your choice of either of two wild experiences: the wicked twists of the blue tunnel or the surprises within the darkened black tunnel. Must be 44" to ride alone. To ride with an adult, children must be 42”. Indiana Beach offers six of the Midwest’s largest and wildest water slides, taking fun-loving riders for a downhill trip to pure summer refreshment. Through twists, turns, high speeds, and a slip-n-slide splash down, sliders are washed into a grand dunk in a refreshing water pool and the perfect enjoyment of the original summer fun. Must be at least 48” to ride. Located right next to the Sandy Beach, Splash Bash is a fun-zone of fountains, waterfalls, splashes, and sprays families can enjoy together. All children under 15 years of age must be accompanied by a paying adult 18 years of age or older. Located in the middle of Indiana Beach Amusement Resort at the Ideal Beach Waterpark you can relax on the sand beach or build a sand castle or just enjoy the waters of this unique swimming pool.